Landing a job after business school MBA degree has never been straightforward. Students should prepare themselves for an ever-changing market. Soft skills are more important skills to earn the first job, than the core MBA subjects of finance and marketing. Students of IPER MBA Class of 2020 learned these and more in the special guest lecture by Ms. Nandita Malhotra, Assistant Vice President, ICICI Securities Limited. 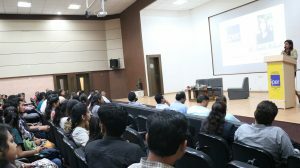 The lecture was held on 27th October 2018 in the full-packed Auditorium in IPER premises. 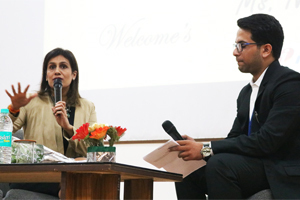 During this knowledge-enriching and informative session, Ms. Nandita addressed the first semester MBA students on “Corporate Expectations from Students and Overview of Banking and Financial Services Industry”. It was a moment when students heard directly from the corporate professional on banking and financial services. BSFI is an industry term that refers to companies that provide Financial Services/Products or both. It comprises of commercial banks, insurance companies, non-banking financial companies, pension funds, cooperatives, and similar small financial organizations. Financial services may include payment gateways, stock trading, mutual funds etc, whereas banking includes investment banking, retail, private and corporate banking etc. Students aspiring to join this industry generally take up finance as a specialization during their MBA course. Recruitment operations are becoming a much more short term with changing market and technology scenarios. Companies seek a specific combination of skills and this combination keeps on changing from time to time. Just an MBA degree does not suffice to the skill requirements in a fresh MBA graduate. While the ability to work with a wide variety of people is one of the most important skills, time management, understanding of the digital impact on businesses and building a sustaining people network is considered as highly rated skills in an MBA graduate today. The most difficult skills identified in today’s corporate industries are big data analysis, brand storytelling, financial forecasting and the ability to use social media to the benefit of the business. Generally, the students pursuing MBA are not able to identify the right skill sets and end up focussing on the least important skills and not giving time to learn the more important ones. The special session with the AVP of ICICI Securities Ltd helped students re-align their focus to win a rewarding job in the BFSI sector.